Although we still have plenty of snow on the ground, it's officially spring! Last weekend, I was more than ready to swap out some of my winter decor for some colorful spring things, and finally got around to making the bright and cheery spring wreath I had been dreaming up for a few weeks. 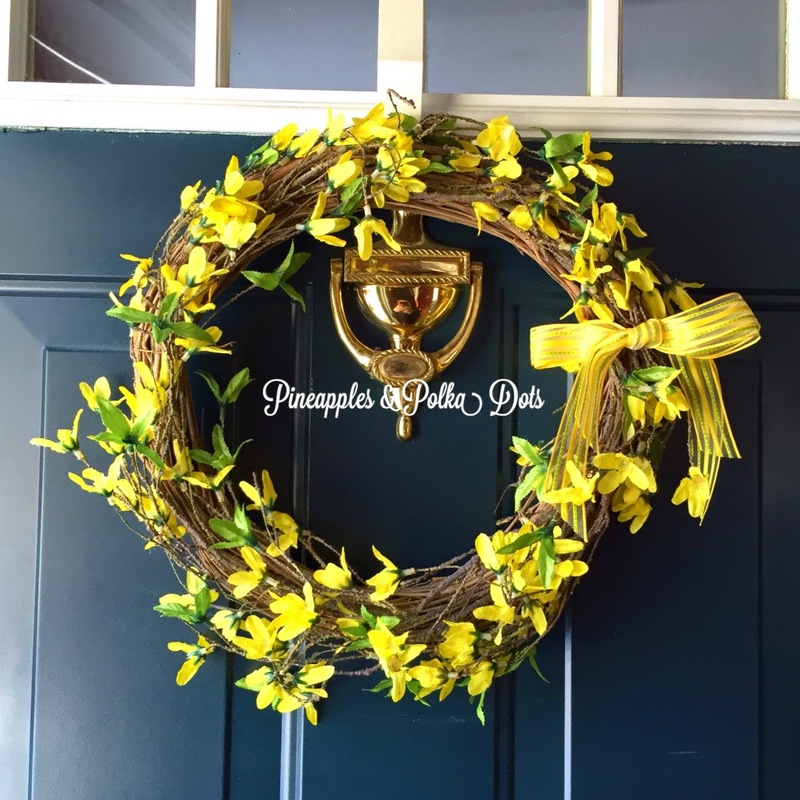 I had a forsythia wreath to hang on the front door. 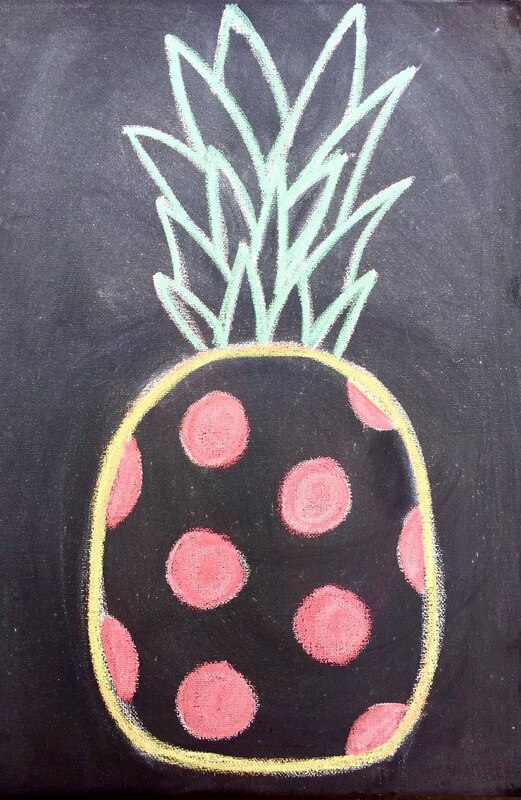 I think the bright yellow pops against the dark green, and the yellow and green ribbon is a pefect match. On one of our interior doors, I hung this one. I love the bright colors, and the different textures of the flowers. Some fabrics are printed, some are solid. It's a bit eclectic, but is awfully fun! I promised to post directions for how to make this, so I won't let you down! I should note that I used pins to secure everything. 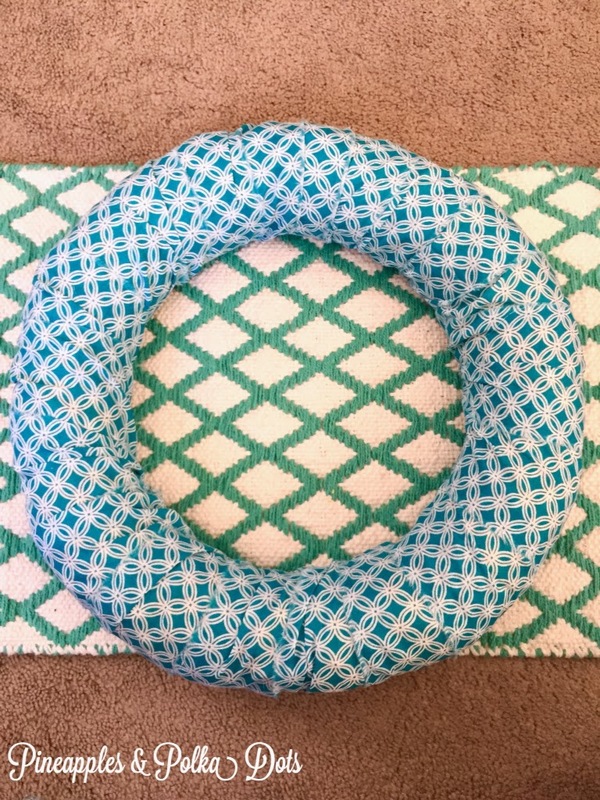 This is in part because I was feeling lazy and wanted to sit on the living room floor in front of some DVR while I got my craft on, and in part because I like the idea of being able to change some or all of it if I want to in the future. I didn't mind the look, so I actually ripped the fabric into 2 and 1/2 inch strips (ish- I just eyeballed it). It helped to snip the fabric at the top, so it was easier to rip. 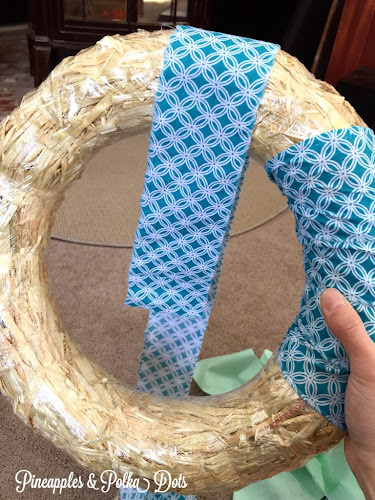 Next, I pinned it into the back of the wreath and got wrapping. 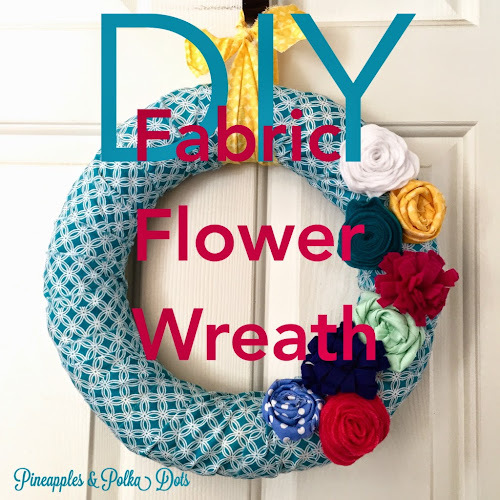 Once I got to the end of the fabric strip, I pinned it to the wreath in the back, and started the next one. This part is really based on personal preference. 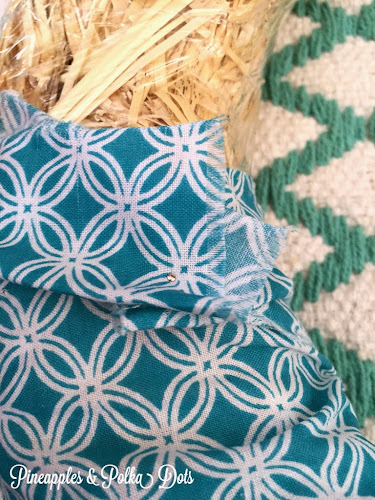 I did not worry about lining the print of my fabric up, I just went along until it was covered. After the wreath is wrapped, you could leave it as is, tie a bow on it, and call it a day if you wanted. I love a wreath with a big bow. I actually love pretty much anything with a big bow, thanks to my former life as a cheerleader. 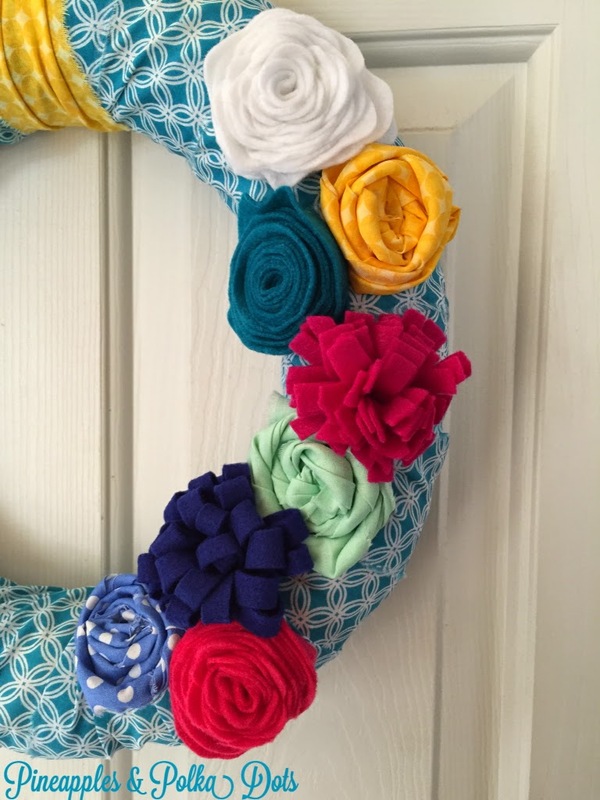 I decided to play with some fabric flowers on my wreath. I had felt leftover from my Valentine's Day heart garland, and had grabbed some fat quarters in a few different fabrics that I loved during my last trip to the craft store, so I was armed with a plethora of choices. This time around, I decided to go with the bright and colorful look, vs. choosing a couple of fabrics to repeat, but you can certainly do whatever makes you happiest. This pompom- style flower is simple! Cut a strip of felt about 2" wide, and snip it almost all the way through, in small increments all the way down the line, so it looks like fringe. Next, roll it up! I ended up with a very tall flower, so I actually trimmed off some of the top to make it flatter, so it would sit better on the wreath. Secure it with hot glue or a pin. 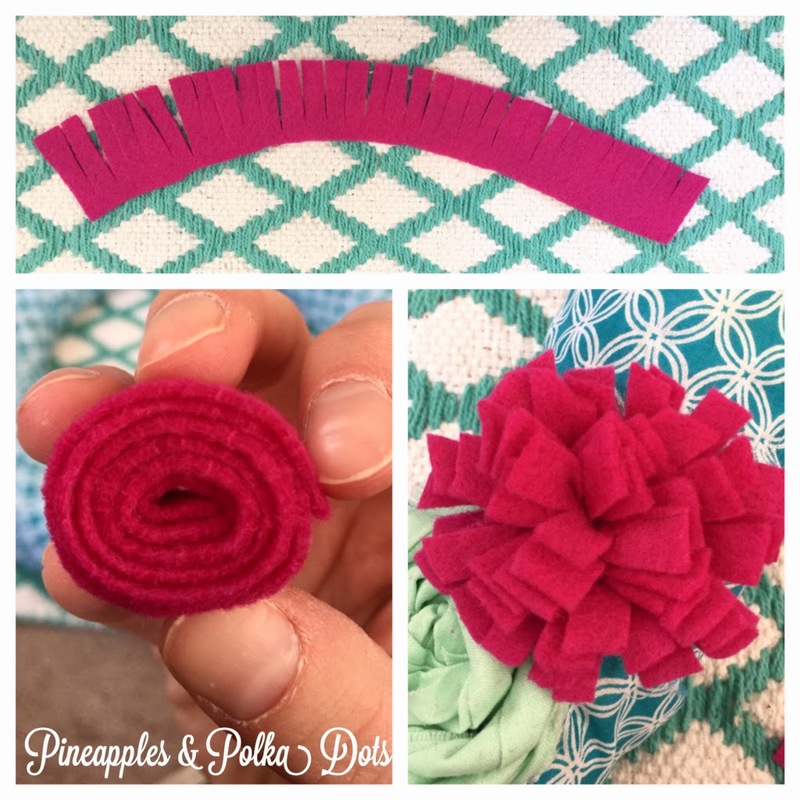 This loop flower is similar, but you fold a wider strip of felt instead. 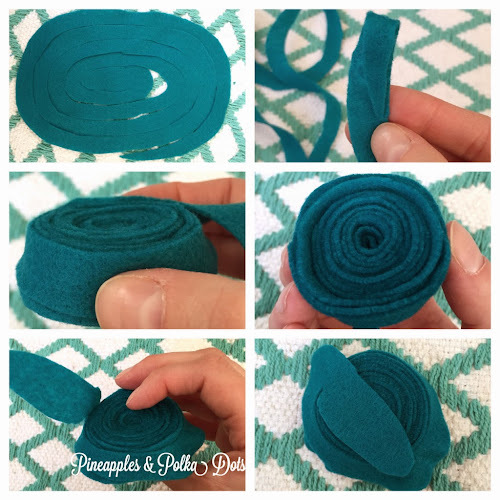 This felt strip is probably 3" wide or so, folded in half, and snipped almost all the way through. When you unfold it, the slits are just down the center of the felt. See above for a photo. Next, roll it up, and secure it. Next, start rolling, going from the outside in. I tend to fold the tip of the spiral over, just to get it started more easily. Once you get to the end, fold the bottom under. If you were hot gluing the flowers together, you'd add glue to the flap on the bottom, and press it against the bottom of the rolled flower to secure it. Otherwise, you can pin it. 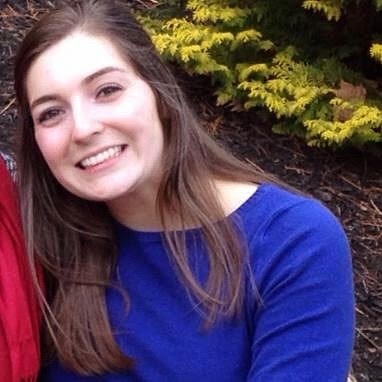 If any parts of the bottom are sticking out, like you can see on mine above, just trim them with scissors. No big deal! This ruffley rose is very similar. I used the same technique, just making the outer edge of the spiral wavy, to create some more petals. 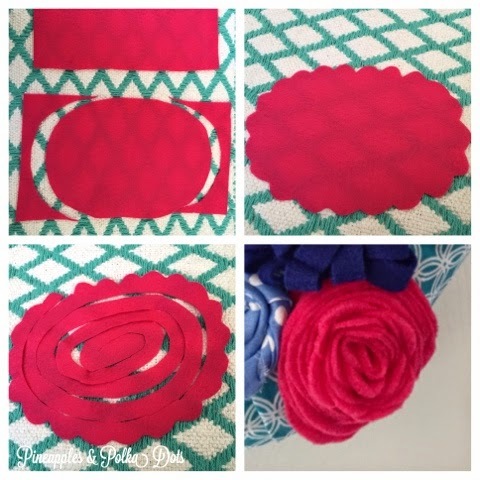 If you want it to be even more textured, cut your whole spiral to be wavy, which is how I made the white felt rose. Fabric roses are not difficult either. 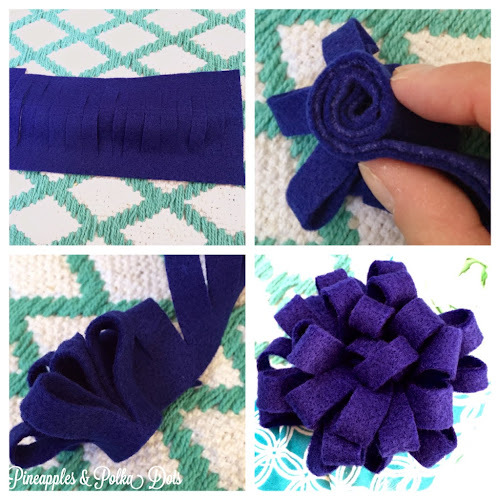 Just twist the end of a 3" wide fabric strip and wrap it around itself as you go. 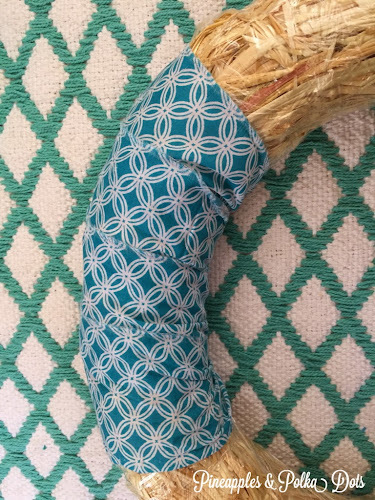 I held the center with one hand and just twisted and wrapped until the fabric was all rolled. You could secure this with glue, and then glue it onto a circle of the same fabric, to make it extra sturdy. If I was making an accessory like a headband or pin, I would definitely do this, but the wreath isn't going to get any wear and tear, so I didn't bother. It sometimes takes me a couple of tries to get these flowers just right, but it's just twisting and wrapping, so it's not a big deal to try again if you're not happy with the original outcome. Next, assemble your wreath! I tried to vary my fabric, flower technique, and color, so two similar flowers weren't next to each other. 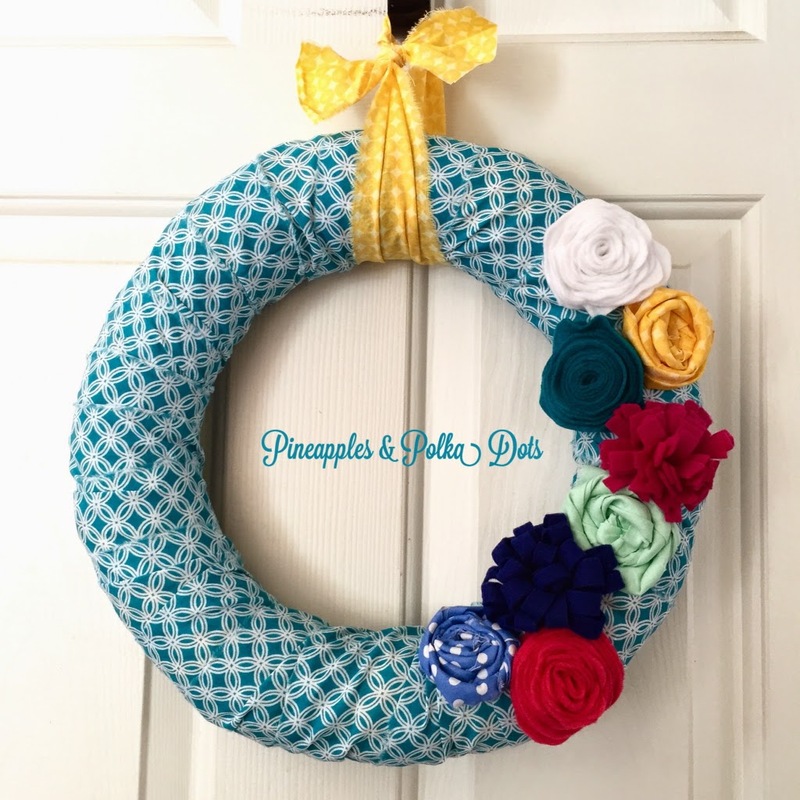 Last, I took some more yellow fabric and looped it through the wreath, and tied off for a way to hang it. I thought about making a more complicated bow, but felt like there was already enough going on, and went for a simpler look in the end. I love how it came out! 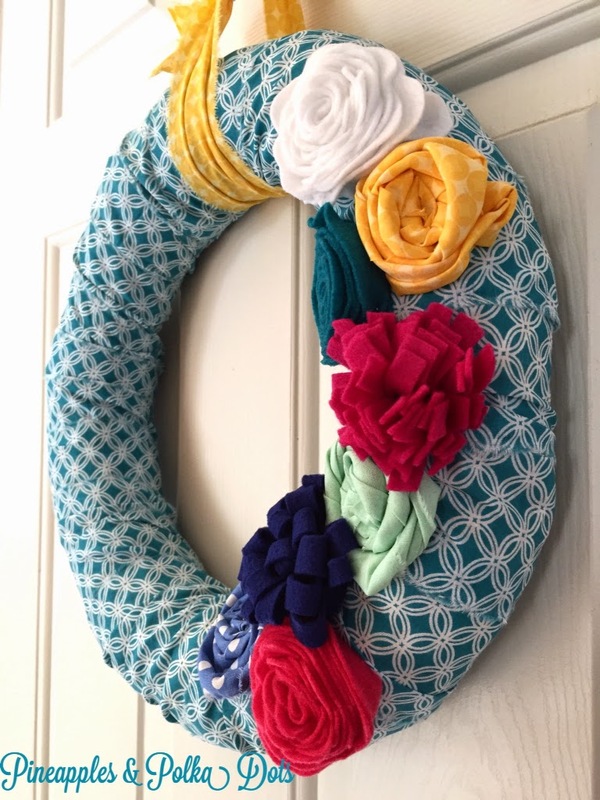 It's different than other wreaths I have, and certainly adds some brightness to our hallway. 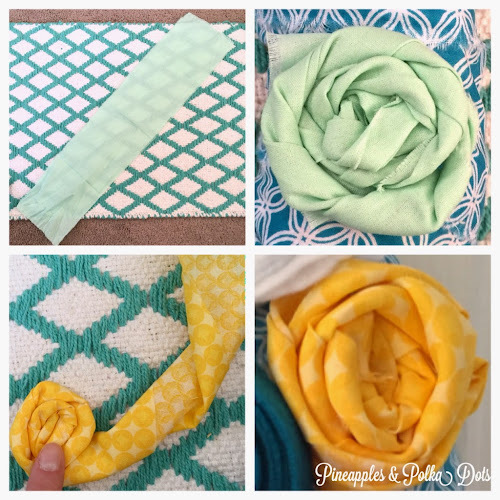 It was a great way to use some of the felt and fabric we had already, and create something new for spring! Have you done any crafting lately? Please share! 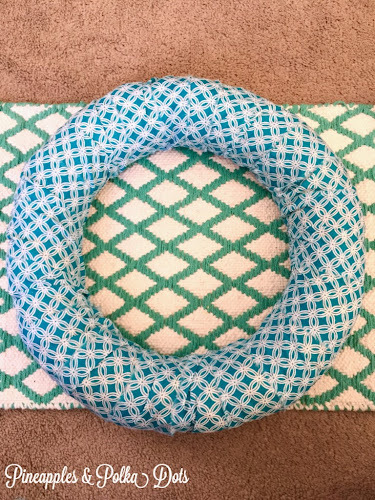 PS: If you like this wreath, you might like this Argyle Heart Wreath, too!